composed of a broad and long tunic with raglan sleeves, worn over baggy trousers tightened to form a ruffle at the bottom. 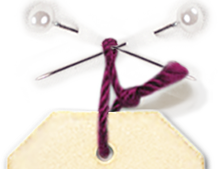 The collar is independent, with three ruffles. Two bubbles decorate the front of the tunic. 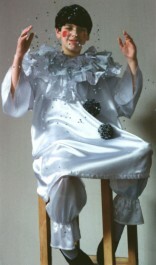 The traditional Pierrots'costume is made in white satin. For the collar, you can switch satin with other shimmer fabrics (lamé etc. ...). Similarly, the bubbles are made of black wool, but you can decorate it with silver or gold threads.